Just think about it, you could be comfortably situated in a new, rewarding career as a Certified Nursing Assistant (CNA). St. Jude Nursing School can help you reach your goals. Your small investment in knowledge can unlock a wealth of new opportunities in healthcare and beyond!!! 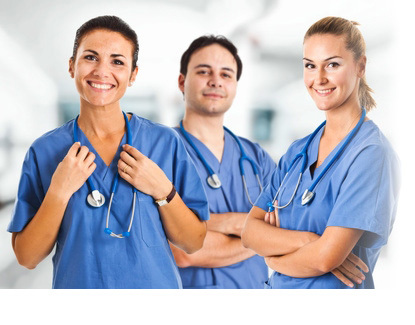 Prepares de Nurse Assistant Student for the State of California Nursing Assistant Competency Evaluation. Certification is after satisfactory completion of the course program and passing of the CA State Exam. This course introduces the students to the role of a nursing assistant with instruction in basic skills and competencies. Theory classes will be held in the classroom and clinical hours will be at the contracted training facilities and laboratory. Upon successful completion of the traning, the gradute will be able to perform vital signs, CPR-first aid, collect patient date, prepare patients for physical examinations, and assist nurses with patients' care. This short term, intensive program meets the requirements as defined by OBRA and California State Regulations. It focuses on preparing students for the California State Nurse Assistant Competency Evaluation Testing Program. After passing the State's Certification Examination, the graduate becomes a Certified Nurse Assistant as defined under State and Federal laws under OBRA 1987. Continuing Education Units (CEUs), for most medical professionals, are essential, not only to renew licensure, but to keep up with the ever changing world of medicine. If your state does not require you to obtain continuing education units it is still important for you to maintain and improve your knowledge. St. Jude Nursing School is the quickest, simplest and most convenient way for you to complete your ongoing Continuing Education Requirements! St. Jude Nursing School has been approved as a provider for Continuing Education Units for CNA & CHHA in the State of California. Certified CNAs are required to accumulate 48 hours of in-service training/continuing education during each certification period. In addition, CHHAs are required to accumulate 12 hours of in-service/ continuing education training each year of their certification period for a total of 24 hours. Equal Educational Opportunities are offered to all who meet entrance requirements, with regard to race, gender, ethnicity, creed, marital status or age. or call us at (818) 892-6141 and one of our representatives will be glad to help you.